JOHN Bateman is poised to take the Test stage by storm. That’s the view of his team-mate Matty Smith, who reckons Bateman will flourish if he makes his England debut against France today. The 22-year-old is one of three Wigan stars set to earn their first caps – along with George Williams and NRL-bound Joe Burgess – in the Test at Leigh Sports Village (kick-off 2pm). And Smith said: “He’s been our best player this year and he’s not only Wigan’s future, he’s England’s future. “He’s raw, he’s young, but the ability he has got – and where he can get to – is scary. Sean O’Loughlin is set to lead England into to the match today with Wigan forward Liam Farrell also featuring. Indeed, Smith is the only one of six Warriors players in the squad not included in today’s line-up, ahead of a three-Test series against New Zealand. He has been dislodged by his club halfback partner Williams. 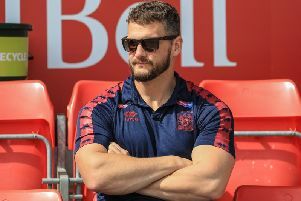 “The competition is good for the squad, especially for the halves, and if you don’t get picked you’ve got to support the boys,” said Smith, who wore the England No.7 shirt in last year’s Four Nations.